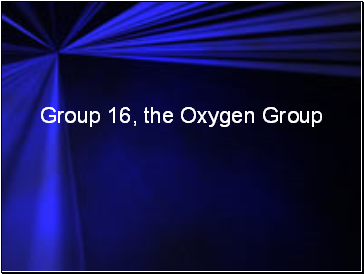 The first two members of Group 16, oxygen and sulfur, are essential for life. 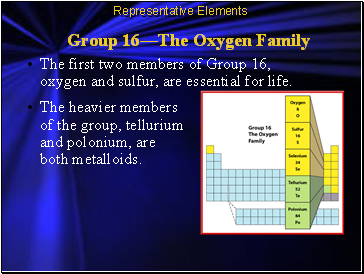 The heavier members of the group, tellurium and polonium, are both metalloids. Ozone, a less common form of oxygen, is formed in the upper atmosphere through the action of electricity during thunderstorms. 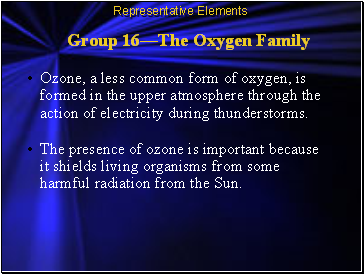 The presence of ozone is important because it shields living organisms from some harmful radiation from the Sun. Sulfur is a solid, yellow nonmetal. Large amounts of sulfur are used to manufacture sulfuric acid, one of the most commonly used chemicals in the world. 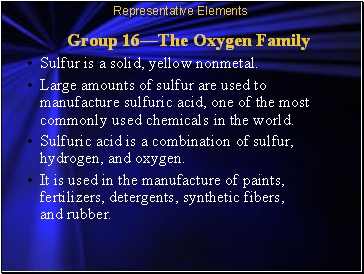 Sulfuric acid is a combination of sulfur, hydrogen, and oxygen. It is used in the manufacture of paints, fertilizers, detergents, synthetic fibers, and rubber. Its most important use is as the light-sensitive component in photocopy machines. Traces of selenium are also necessary for good health. About 20 percent of Earth’s atmosphere is the oxygen you breathe. 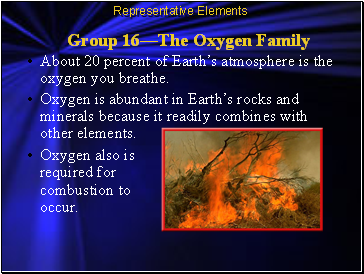 Oxygen also is required for combustion to occur. 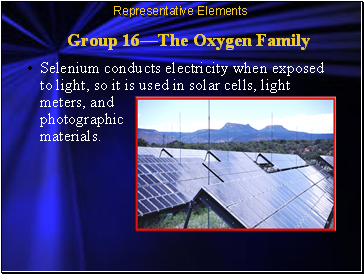 Oxygen is abundant in Earth’s rocks and minerals because it readily combines with other elements.